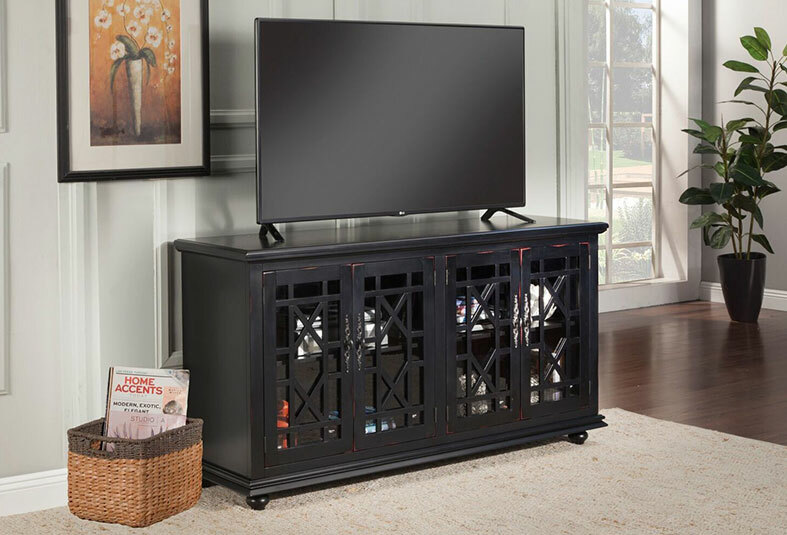 Our solid wood, one door TV stand makes for a perfectly practical and pretty media console in your home. Made up of durable wood and metal hardware on the two front drawers, door hinges and door handle, to give the ultimate traditional yet slightly rustic feel to your living room. The visible inside shelving is adjustable for customizable storage. Place your TV on top to use as a media stand while your picture frames, ceramic vessels and a stack of books decorate the open shelves and glass front cabinet. Smooth lines and a dramatic glow are some of the features that make the Eleanor TV Stand an exquisite piece of furniture. As you watch an enticing drama with family, enjoy the fireplace feature within this tv stand. If your style leans toward modern farmhouse, shabby chic or country cottage, you’ll find this extra large TV stand perfectly in step. Its gently distressed, two-tone finish pairs weathered oak with antique white for a charmingly quaint character. Enchanting elements include cabinets adorned with crossbuck trim and glass inlays. Adjustable shelving and wire management cutouts make it easy to accommodate your media needs. If your style falls under urban, rustic, or even natural then this TV stand is the perfect addition for your home. This TV Stand brings a new meaning to versatility with its fireplace or audio system insert options. Acquire this TV Stand for the urban-rustic aesthetic your home deserves. Cruise to the living room for a family movie night with the help of the Hermes Console. Its burnt cherry wood physique can help support your HD TV and store all your remotes and game systems. This console is truly a gift from the gods. The Orsay Media Console features a beautiful Antique White finish with sophisticated transitional styling. Elegant trellis details on the glass doors, intricately cast door pulls, turned bun feet, and architectural moldings are all blended together for an exquisite look. Made with solid pine and finished with a rich walnut interior, this entertainment console features: Three wire management grommets on back panel and one fixed shelf. Three functional drawers with front English dovetail joinery and ball-bearing glides. Doors featuring hand forged iron accents and clear glass, protecting objects and electronics while allowing remote control use. Hand-turned feet and handles, oversized moldings.